Cider making kits based on apple, pear or other fruits or berries have become very popular as new cider brands such as Kopparberg have conquered the market. Now you can make your own cider, as simple as any wine kit! Based on a large amount of apple concentrate, this kit includes all you need to start brewing. Just add water. All the new Bulldog Ciders are also equipped with the newly developed special cider yeast, promoting all the qualities of the juice. Makes 23 litres. With 3 kgs of concentrate, this kit contains all you need. Just add water to start brewing. Makes 23 litres. A stunning 3kgs of concentrate, flavoured with raspberry and blueberry, creates the perfect summer drink. Just add water! Makes 23 litres. Like the popular commercial flavoured cider, this is a perfect summer drink. 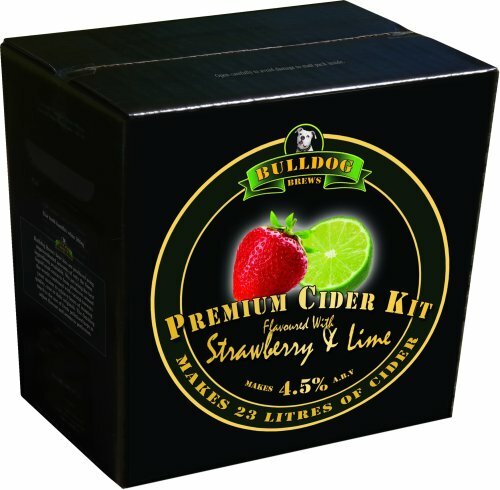 All is included, simply add water to make 23 litres of your own Strawberry & Lime Cider. 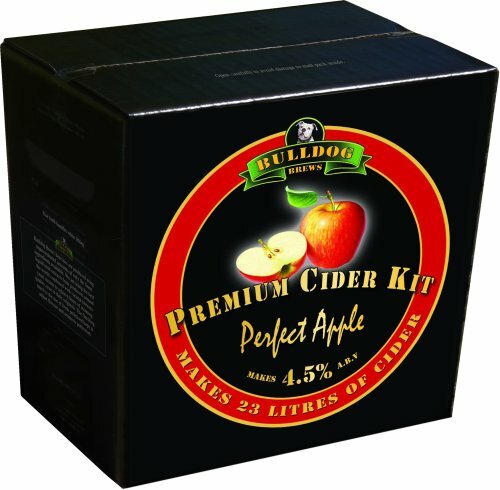 A fantastic quality cider kit based on almost 100% natural apple concentrate. Makes 30 bottles in only two weeks, just add sugar and water. Magnum Cider Instruction here (for all the Magnum Cider making kits). 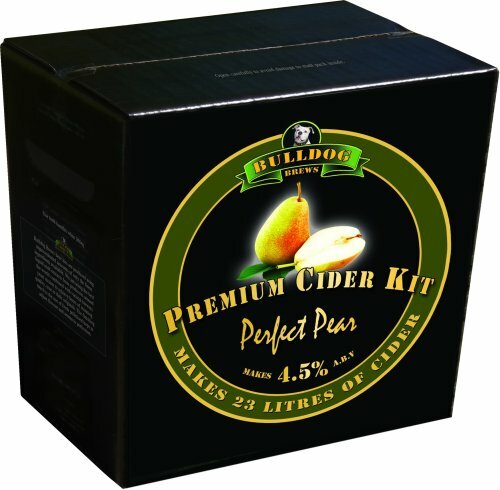 This might be the only Pear Cider kit on the market, in any case it is certainly the first one. With almost 100% pure natural pear concentrate, this is an impressive kit, making 30 bottles of your own Pear Cider in only two weeks. Just add sugar and water (for full details see instruction). Based on natural extract from elderflowers, this very refreshing cider is the perfect summer drink. Make your own 30 bottles of elderflower cider in only two weeks from this cider kit. Cider and strawberries - two of the best ingredients of a British summer. We have combined them into the Magnum Strawberry Cider, a very refreshing and natural drink. Make your own cider in only two weeks, this kit makes 30 bottles. This refreshing and very natural Cider Kit comes from New Zealand. With an especially well composed mix of New Zealand apple juices, this cider will turn your world upside down. Make 30 bottles of your own New Zealand Cider in only a few weeks! An exciting cider kit from Finland, made from a mix of apples and pears which gives it an unusual freshness. Makes 24 litres of refreshing Scandinavian cider in only two weeks. 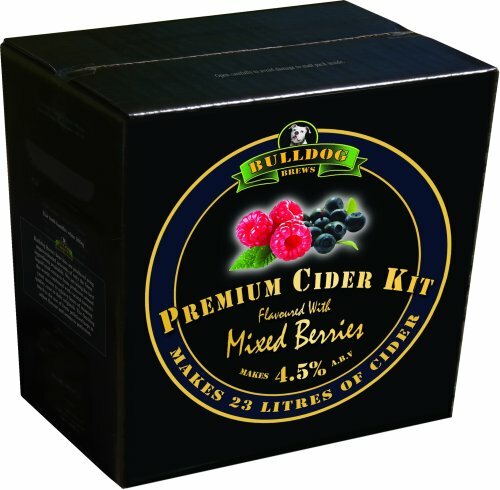 Cider making kits for homebrewers are new to the UK market. In the past there might have been the odd apple cider kit, but with new commercial brands such as the famous Kopparberg (made in Sweden) expanding the range of different ciders, homebrew supplies have also increased. Cider kits are now available in a lot of new exciting flavours and you can make your own cider in as little as 2 weeks with very little effort. Cider making was never easier and you can now choose from exciting ciders from all over the world. Cider kits made easy! When you buy a complete cider kit, all other ingredients you need for making your own Apple or Pear Cider or any other type, are there. Basic winemaking equipment, mainly a large fermenter (bucket) are the only gadgets you need, except of course for good bottles (get the flip-top ones from your home brew shop, they save a lot of hassle and can be re-used). All about cider recipes here, how to make your own cider from fruit etc.